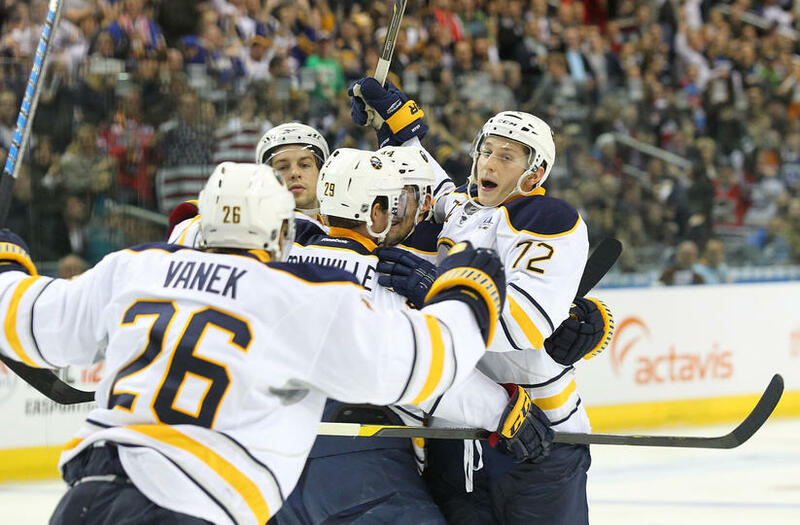 The Buffalo Sabres finished up their European tour, where they outscored their opponents by a score of 8-3, with a 4-2 victory over the Los Angeles Kings earlier today. 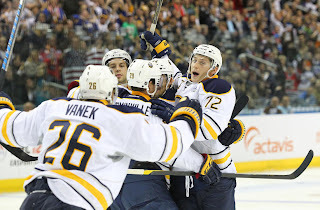 This win concluded a trip where the Sabres easily beat their opponent in both of their contests. The first contest of the season, against the Anaheim Ducks, was also won by the Sabres by a score of 4-2. When the Sabres return to Buffalo they will come home with a 2-0 record, a power play unit that seems to have clicked quite well, and the feeling that they just beat two teams that are supposed to be some of the tougher teams in the league. Through two games, Thomas Vanek leads the team with five points after scoring twice and adding three assists over the course of opening weekend. While newly named team captain, Jason Pomminvile, and rookie, Luke Adam, round out the top three in points with four a piece. One major factor that has lead to the Sabres' early success has been the team's power play unit. The Sabres scored on three, Vanek twice against Anaheim and Drew Stafford once against Los Angeles, of eight chances in the two games played. Along with the success on the man advantage, the Sabres have received support outside of the big names like Vanek and Pominville. Six different skaters, including Ville Leino and Paul Gaustad, found the back of the net and were apart of the 12 different skaters that recorded at least one point this weekend. The Sabres seemed to be hungrier than both the Ducks and Kings, outplaying both teams in front of the net and finishing several rebounds. Along with solid offensive production the Sabres received stellar goal tending from Ryan Miller, who made 60 saves on 63 shots over the course of the two games. The Sabres will return to The First Niagara Center for their home opener against the Carolina Hurricanes on October 14th, where they will look to continue their strong start.